When tooth extraction is essential to your well-being, compassionate care makes all the difference. Whether you need your wisdom teeth cared for, or a tooth extraction in preparation for an implant, Dr. Salee’s procedure is as pain-free and comfortable as possible. Dr. Salee and his staff treat every patient in the way they’d wish to be treated themselves – with the least intrusive procedure that produces the best results. We make every attempt to catch cavities, inflammations and small problems before they become large ones. Despite our best efforts, sometimes teeth are in such an advanced stage of damage that extracting the tooth is essential to our patient’s dental and overall health. Rest assured that Dr. Salee will thoroughly explore other options, and inform you of any other possible procedures, before ever presenting you with the recommendation to remove a tooth. 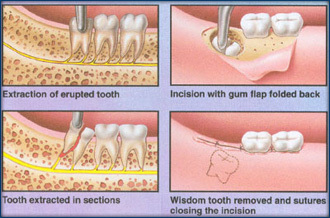 We understand that having a tooth extracted is not an easy decision, and is considered a last resort. Should oral surgery in Boynton Beach FL become your best option, we offer conscious sedation dentistry, and in other ways seek to make the procedure as pain-free, comfortable and caring as possible. Replacing a Missing Tooth is of Utmost Importance! It’s important you replace the tooth that has been extracted to maintain stability and ideal function in your mouth. This helps avoid problems and complications that will have a major impact on your dental health. A missing tooth can cause significant and serious problems with its neighboring teeth. These may shift or move, affect your ability to chew, change your jawline and erode the strength of the jawbone. For more information on oral surgery in Boynton Beach FL, click to read about Dental Implants and Cosmetic Crowns.